A woman’s hands can tell her age faster than her Facebook Birthday post. My wife glanced down at her hands and asked me, “why do my hands look like they belong to my mother?” Well, even though the CIA, FBI and IRS don’t know how old my mother-in-law is her hands reveal the truth. Patients often focus on facial rejuvenation as the only way to recapture a youthful look while ignoring the appearance of significant aging in their hands. Volume (subcutaneous fat) depletion in hands causes the extensor tendon and veins to show, plus the skin appears more wrinkled. All of our skin thins as women & men get older, which is a normal part of aging. God has a sense of humor- as we age we lose fat in our hands & face, only to gain it in our hips and waistline. Then to top it all off the unsightly brown spots appear, as if overnight, to make you regret the years of sun exposure without sunblock!The good news is there are ways to address these problems. There are a variety of filler options to correct volume loss including: Hyaluronic Acid (HA) fillers (Juvederm & Restylane), stimulatory fillers (Sculptra), calcium based fillers (Radiesse) and your own fat (micro fat grafts). The procedure is simple and done in the office using local anesthetics. 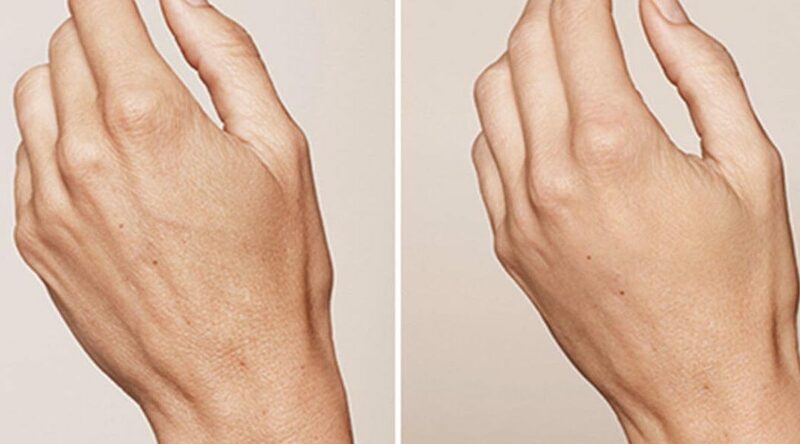 The material is injected into the back of your hands to fill the voids and give a smooth, more uniform contour.The brown spots or age spots as my mother calls them, are treated with cryotherapy which is a freezing of the skin spot. This causes the spot to blister and peel off after about 7 days. Initially after the freezing (cryotherapy) the brown spots are darker and actually look a little worse. This will resolve in about 2 weeks when the brown spots are replaced by pink spots that gradually fade. Sun block and sun avoidance are a must to maintain the results. It is impossible to make these age spots completely disappear but we expect a dramatic reduction in their appearance after this treatment. Adding a microdermabrasion series to this treatment regimen will also help rejuvenate the appearance of the skin and exfoliate the rough skin on hands.There is no way to avoid volume loss in your hands…except dying young or wearing gloves. Don’t let your hands give your age away. Turning back the “hands” of time allows you the luxury of understating your age if you so choose.